Switzerland is far from the world’s cheapest travel destination. As such, finding savings at a hostel is not only a bonus but, for many, a requirement. My time in Switzerland revolved around a stay in the town of Bern, where I crashed at the Berne Backpackers Hostel – also known as Hotel Glocke. The hostel is pretty much everything you’d expect from a Swiss property. It is clean, comfortable, organized and safe. The hostel itself was really good; however I did spend all three of my nights in town completely sleepless. Two of those nights were thanks to music and people in the bar below the hostel and on the street, and the third thanks to one of the heaviest snorers I’ve ever heard. Still, I enjoyed my time at the hostel. The rooms are quite standard dorm rooms. I stayed in a 4 bed dorm that had quite a bit of space, nice comfortable beds, and lockers. They also did the little things right in the room, there were plenty of power outlets and there was a light above each bed. The rooms do not come with an ensuite, but there are showers and toilets just outside the rooms, separate for male and female. The hostel had really great facilities. The common area tripled as a TV room and a restaurant. The kitchen had loads of space and good appliances. However, there was no oven which means that those of us who get cravings for frozen pizzas had to cook our pizzas in a pan (yeah, that’s how I roll). There are also a couple vending machines selling drinks and, more importantly, Swiss chocolate bars. There is free wifi although it can only be accessed in the common area. 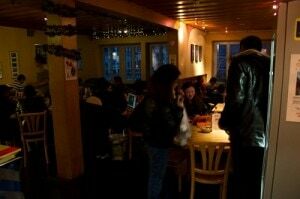 It’s not an issue at all as there is plenty of table space and lots of outlets in the common room of the hostel. The staff of Berne Backpackers was really pleasant when I was there. They were very helpful in showing the facilities and explaining the city. I thought there were a couple times that they were a bit understaffed. There was quite often times where a “be back in 15 minutes” sign was up. Also, there was no staff on overnight. It was Easter weekend when I was there, so I’m not sure if that had anything to do with it. Again, no issues with the staff themselves as they were great, I just thought they were a bit under-staffed. Well, nothing in Bern really has a bad location. The town is small and you can get basically anywhere in a five minute walk. At first glance, I really liked the location. It was off the main streets, but not too far for it to be annoying. However, the bar below the hostel got really loud, and maybe I was just in the wrong room, but it was very noisy in my room. I’m not sure if those in other rooms had the same problem as I did, but having a loud party run until about 5am when you’re heading out to ski at 6am isn’t exactly a whole lot of fun. I thought the place had a great atmosphere. I really liked the ambiance of the common room and how everyone congregated in the same place. Generally speaking, the guests at the hostel quickly all became buddies as it was very easy to meet people here. I have a bit of a hard time judging the fun aspect of the hostel as I was really busy putting together my magazine and going on ski trips to really take part in their activities, but there was lots available. I would gladly stay at the Bern Backpackers again in the future. I would only ask that I be put in a room that wasn’t directly above the bar. I don’t mind missing out on sleep because I’m at the party, but when a party keeps me up it’s much less fun. I really enjoyed the common space and the feel of the hostel. It was a nice and cozy stay. For more information on Bern Backpackers, or if you’d like to book a couple nights, be sure to check out their page on hostelbookers.com by clicking here.